Available in 3 models PIC1, PIC2, PIC3 catering for flatscreen TV's from 32" to 50"
This is the latest innovation from Future Automation the world’s leaders in creative lifting systems designed to hide flat screen televisions. 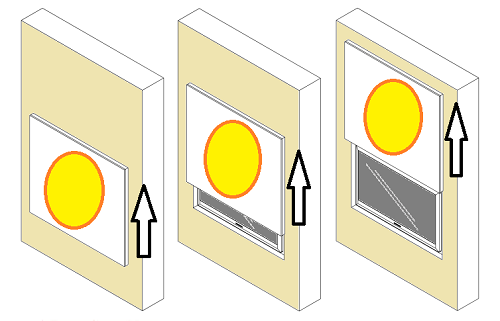 This mechanism provides a motorised vertical motion for raising or lowering artwork to conceal a wall mounted TV screen recessed into the wall behind. The Lift comes in three different models catering for screen sizes from 32" to 50" and has a lifting capacity of 10kg. Included with the lift is a IR remote control along with RS232 and contact closure control enabling easy integration to any existing home automation control system. The motorised picture lift can be configured to raise or lower artwork dependant of available wall space for the artwork to move into. 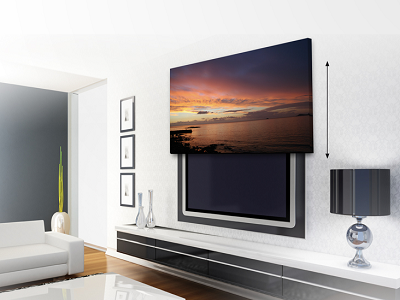 The lift is designed to be used with the TV recessed into the wall and holds the artwork 10mm from the wall to avoid any obstructions during travel. The mechanisms motor provides a near silent smooth operation with adjustable travel strokes allowing installers to programme the exact travel of the lift. AV Installs Ltd also offers full installation services for the vertical moving artwork lift and can also assist customers with printing and original artwork if required. If you’re looking to hide you television with moving artwork call AV Installs today on 0800 669 66 00. Example of Vertical Panel Lift Movement. A brilliant service received from AV installs, from the help and advice we received at the design stage right through to the quality workmanship received. When I brought the tapestry I was not sure if it could all fit in the space available but AV Installs assured me all would be fine. I couldn't be happier with the final solution a true centre piece of our newly refurbished flat, it always attracts allot of admiration and attention from visiting guests. Thanks for all your hard work and its great to see a video of it now on your site. Hi Paul Thanks for your question, we have numerous solutions for hiding flat screen TV's it does not make a difference that it is a curved TV as they all have standard VESA patterns on the back. The only additional thing to consider is the extra depth. If you could call in on 01604 493755 and ask for Boyd we would be more than happy to discuss various options open to you. Hello I am in the us. and have a customer that is looking for a application like this. What is the largest that this unit will work with. Hi Brian Yes the PIC lift can be used in reverse and lower the picture to reveal the TV, everything is exactly the same just upside down. Hi There, I am wondering what the max size of screen you can use with the motorized vertical picture lift? Hello, am I correct that the tv needs to be IN the wall instead of ON the wall?